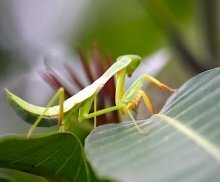 The Malaysian mantis belongs to the order of Mantodea in the Insect world. Almost always we will find this insect in its typical "praying" position, hence its common name "praying mantis" (or praying mantid). The front forelimbs (sometimes referred to as forelegs or forearms) seem to be always clasped in front of its face, as if in prayer. 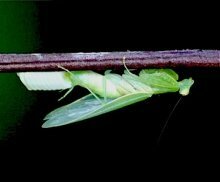 No wonder it is said that the Chinese have a peculiar respect for these mantids, as they seem to be always bowing and holding their hands in prayer, the Chinese style. But make no mistake. In this "praying" position, they are actually poised and ready to capture their prey, which is usually the small, flying insects that come their way. Hmmm... perhaps by constantly praying, they almost always get their prey. If we look closely, we can see that the forelimbs of most species are larger compared to the middle and hind legs, and have rows of inward pointing spikes that will ensure a tenacious grip on any prey that is captured. Mantids are carnivorous insects, clever with camouflaging themselves to blend with the surroundings, and are considered one of the top predators in the Insects world. 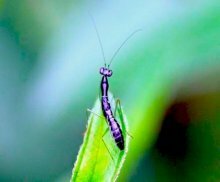 That is why some naturalists suggest that they should actually be called "preying" mantids instead for their very efficient way of hunting their prey. They consume most small insects and pests like aphids, fruit flies, gnats and mosquitoes. Larger mantids will prey on flies, moths, grasshoppers and small crickets. However, as part of nature's food chain, praying mantises in turn are eaten by birds, bats, frogs, spiders, monkeys and even snakes. But did you know that the Malaysian mantis can also be very cannibalistic at times? For instance, the female praying mantid, like many spiders, may occasionally feed on the male while mating, eating its head and body. It is a source of valuable protein nutrition for the eggs to mature. And we will even find that baby mantises may start to feed on each other after they hatch, eating its brother or sister, as food. These insects have a relatively long body and triangular head with large eyes and sharp mouthparts. The head is supported by a highly flexible neck, and the head can rotate and swivel to allow maximum opportunity for prey detection. Mantids, like some other insects species, are among the hemimetabolic insects. They go through three stages of metamorphosis, that is, egg, nymph (or instars stages) and adult. The female mantises lay a foamy mass of eggs, normally on small branches and stems, which will later harden to form the ootheca (egg case). 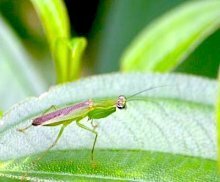 The baby mantids hatch at the same time, and while the nymphs or young ones (which are often mimics of black ants) may be of different color, smaller and wingless, the adult mantises in Malaysia are usually light green or brownish in color. This is to blend with the color of leaves, twigs and plants, and they also possess translucent wings, to fly from one plant to another. In certain parts of East Malaysia, we can also find beautiful light pink colored species that melt with their surroundings and habitat to hunt. And of course there is that beautiful insect, the Malaysian orchid mantis (hymenopus Coronatus) that are whitish and pinkish in color like the orchids they camouflage themselves on. Praying mantises usually live for about a year. In the old days we children believed that praying mantises were thought to be able to tell how one sleeps. I remember when with friends and cousins, while holding a praying mantis in our hand, we would ask it how so-and so sleeps, for example, "Praying mantis, how does Ali sleep?" And the insect will move its head and legs as though telling us the sleeping gestures of Ali when he is sleeping. It made for some good laughs because of the way the insect seems to sway in different variations when asked of another person. Of course, with this "information", we would certainly not want to share our bed with a visiting cousin who kicks wildly once a while during his sleep! So, when you go into the gardens, parks or forests of Malaysia, do not forget to also look out for this wonderful creature of God -- the Malaysian mantis. And when you catch one, hold it gently in your hands, and ask it how your friends sleep, just for fun. But don't forget to gently release it back to where it belongs. Mantids are beneficial to us as they help rid other insects that are sometimes pests to us humans. Return here from Malaysian Mantis to Insects of Malaysia homepage. Return here from Malaysian Mantis to Malaysia Wildlife and Nature homepage.